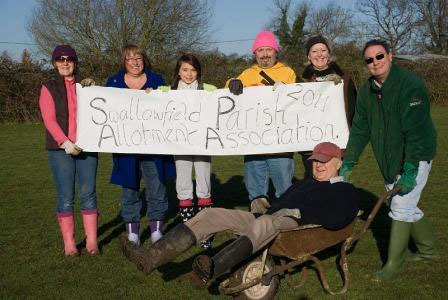 The Swallowfield Parish Allotment Association (SPAA) began life in January 2011 with a small team of people on a mission to change the Calico Field into a community asset! Many weekends were spent clearing and tidying by an army of volunteers, followed by the local farmer ploughing and harrowing. In a very short space of time the field was transformed into parcels of land and the allotments were born. 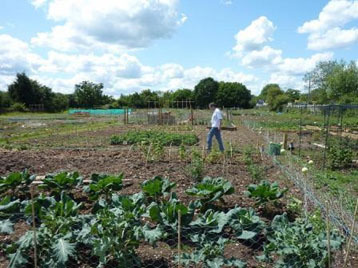 Allotmenteers and friends celebrated the transformation with an official opening on 2nd April 2011. Funds were granted by the Parish Council, the National Lottery Awards for All and the Swallowfield Horticultural Society so that gates, fencing, car standing area and water troughs could be erected. Since then allotment holders have dug and hoed, planted and weeded, pinched out and picked their hugely varied crops, and have also done wonders to attract wildlife and encourage biodiversity which is a key aim of the SPAA. Our objective is to provide allotments to help promote healthy lifestyles, strengthen our community, create bio diversity, and enhance our environment. The benefits of the allotments include, growing our own food, educating our children about where food comes from and how to look after the land. In addition, achieving improved health, both physically and mentally, through exercise in the fresh air with other like minded people, and enjoying the fruits of our labour. We hope all this will go to build a stronger community in Swallowfield Parish.